Skin cancers are divided into two main groups, namely: melanoma and non-melanoma skin cancers. To read more about melanomas click here. 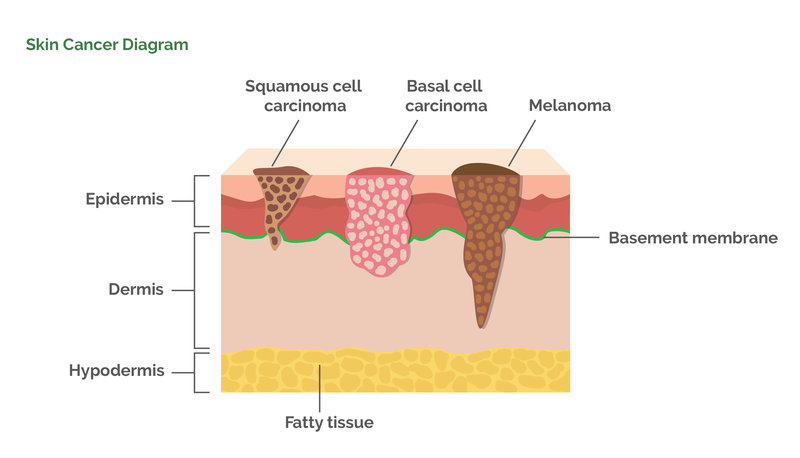 Non-melanoma skin cancer is the term given to two main types (in terms of prevalence) of skin cancer: basal cell carcinomas and squamous cell carcinomas. Basal cell carcinoma is more common than squamous cell carcinoma and in some sunny countries up to 50% of white people will develop one in their lifetime. Another type of non-melanoma skin cancer is merkel cell carcinoma. This is a rare form of skin cancer. A carcinoma is a cancer that develops on an epithelial surface. Many organs have surfaces that are lined with epithelium (lung, colon, stomach, liver, breast, etc.) and if a cancer develops from the lining membrane of an organ it is named according to the organ that it arises from (i.e. lung carcinoma; colonic carcinoma; stomach carcinoma; liver carcinoma; breast carcinoma; basal cell carcinoma). The skin has two main layers: the epidermis and the dermis. 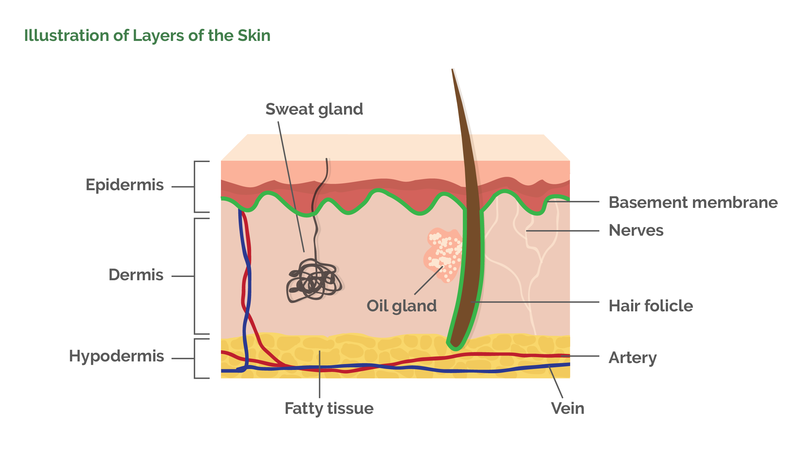 The epidermis is the outer layer of the skin and has the main functions of waterproofing us and controlling our body temperature. The dermis is the strength part of the skin (the part of animal skins that gets turned into leather) and can resist the many daily knocks and bumps that we experience. The epidermis and dermis are separated by a very thin but very strong membrane called the basement membrane. This is a very important structure when it comes to understanding melanoma. The epidermis itself is divided up into several layers. 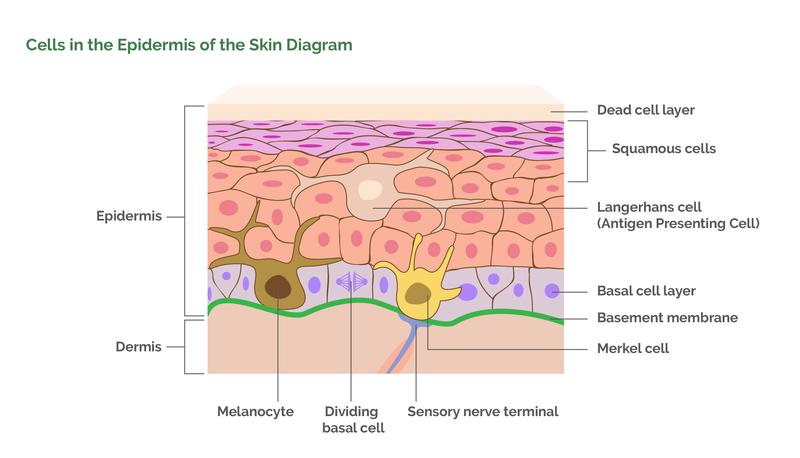 The bottom (or basal) layer contains the cells (basal cells) that are constantly dividing to replace dead skin cells that are lost from the surface. Scattered amongst the basal cells are large flat cells with multiple extensions called melanocytes. Melanocytes are our tanning cells. When stimulated by ultraviolet light, enzymes within the melanocytes are activated to produce melanin pigment which is then transferred to the new cells that are being produced in the basal layer. The melanin pigment is positioned around the nuclei of the new cells and performs the function of absorbing ultravioletradiation from the sun and thus protecting the cell’s DNA from damage. Of interest is that the stimulus for melanin production is actually damage to melanocyte DNA. So, having a tan signifies that damage has occurred to the DNA of one’s skin cells. A cancer occurs when a cell starts to divide uncontrollably and no signal is given for this to stop. The type of cancer that results depends on what type of cell becomes cancerous. If it is a cell in the lining of the lung then lung cancer results. If it is a cell lining the colon then colon cancer results. If a melanocyte becomes cancerous it results in a melanoma. Every different type of cell in the body can potentially become cancerous. The behaviour of each type of cancer depends on what type of enzyme the specific cancer cells are able to produce. Some cancers only produce enzymes that result in destruction of the tissues around them (Basal Cell Carcinoma). Others have enzymes that enable them to bore holes into blood vessels and lymphatic channels. This gives them access to the circulation and the lymphatic system and allows them to spread to one’s organs or to one’s lymph nodes. When cancer spreads like this, it is known to have metastasised. We all have cancer genes in the DNA of our cells - the purpose of which is not yet known. These cancer genes are kept switched offwhen cells are functioning properly, but if a cell’s DNA becomes damaged (by cigarette smoke or by ultraviolet (UV) light, for example) in a sensitive area, a cancer gene may become activated. If this happens, that cell turns into a cancer cell and starts to multiply uncontrollably. The main cause of melanomas is damage to one’s skin by UV light from the sun. The UV light penetrates the DNA in the melanocytes causing damage. If this damage results in a cancer gene becoming active, a melanocyte turns cancerous resulting in a melanoma. 70% of the body is composed of water. As blood is pushed through the capillaries (the smallest blood vessels), the pressure causes some of the water in the blood to be squeezed out of tiny pores in the wall of the blood vessels into the surrounding tissues. If this water was not collected and transported back to the heart, one’s arms and legs would become massively swollen within a day. To prevent this from happening there are multiple water channels (lymphatic channels) within the tissues (particularly the skin) that collect the excess water and carry it back to the heart. At certain points the water channels pass through lymph nodes (glands) which filter the water that passes through them. Any bacteria, foreign material or cancer cells that are carried with the water in the lymphatics also enter the lymph nodes and are trapped there. Lymph nodes are full of antibodies and immune cells which then proceed to attack anything that is perceived to be a threat. The lymph nodes are concentrated in certain parts of the body: the groin, arm pits (axilla) and neck. How common is a basal cell carcinoma and is it necessary to treat? Do squamous cell carcinomas spread to other parts of the body? Does sun damage cause Merkel cell carcinomas?